Another Vote Ahead For Pot In Colorado: This Time, On Taxes As Colorado lawmakers debate rules regulating recreational marijuana use, one big question looms: how to charge taxes that will fund oversight of retail pot businesses. The tax requires a statewide vote. If it fails, some worry that underfunded enforcement will invite the feds to shut recreational pot down entirely. 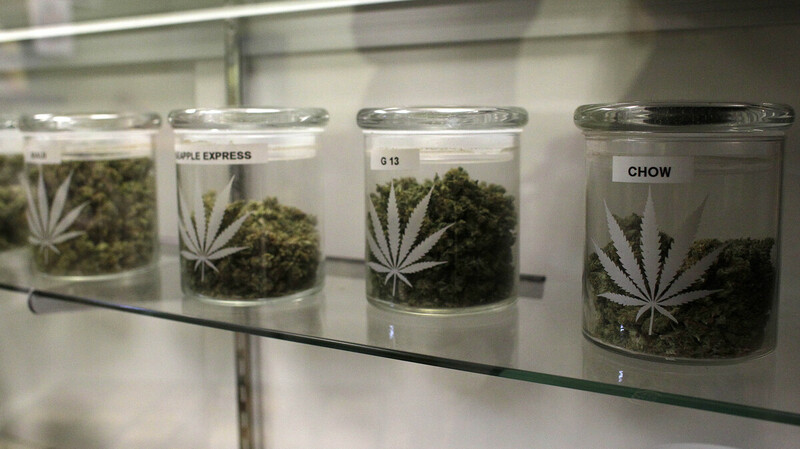 Medical marijuana has been legal in Colorado for more than a decade. Coloradans voted to legalize recreational use in November, but lawmakers say the industry can be properly regulated only if voters approve a new tax. This week, Colorado lawmakers hope to pass the first comprehensive set of recreational pot regulations in the country. The proposed rules involve who can sell it, where and to whom, and also include a big new tax — one that voters must go back to the polls to approve. Most people who smoke marijuana smoke it out of a pipe or rolled joint. But not Dan Pope. He uses a vaporizer called "The Volcano." The device, which he says "resembles a kitchen appliance of sorts," is stainless steel with a plastic bag attached to the top. As it gently heats the marijuana, the vapors collect in the bag. Pope can puff on the bag to relieve the pain from his muscular dystrophy. "You avoid the noxious gases associated with the smoke," Pope explains. "It's a much lighter, healthier way to use cannabis. And my doctor actually prefers that I do it that way." When legalization passed in Colorado in November, Pope initially thought he could drop his medical marijuana license, which costs $35 a year, requires a doctor's visit and puts his name in a state database. But then he heard that taxes on recreational marijuana could be more than 30 percent. "If a patient's budget is $100 a month on medical marijuana, that's a $30 to $40 a month increase," Pope notes. And that, he says, is too high a jump for his fixed income. No one knows how many of Colorado's 108,000 medical marijuana patients will hold on to their medical license for the cheaper pot it offers. And that's made dispensaries cautious about moving to recreational sales. Norton Arbelaez is a co-owner of RiverRock Wellness in Denver, where customers browse dozens of jars packed with bright green marijuana buds. Medical shops like this one get first crack at becoming recreational, possibly as soon as January. Arbelaez says his business will cater to both types of buyers, kind of like a chain drugstore. "And so, if anything ... think about a Walgreens, where part of the Walgreens is over-the-counter and part is a controlled substance," Arbelaez says. "That is more or less what, conceptually ... it's going to look like." Sure, many patients will choose to keep their medical license. But Arbelaez also expects big things from the recreational side of the business, which will be open to anyone over the age of 21 with a valid ID. Arbelaez is conflicted. He wants a low enough tax rate so the store's product can remain cost-competitive with the black market. But, he says, "the industry wants to pay its fair share. The industry wants to contribute to the coffers of the state of Colorado. We want to pay our own way in terms of regulation." "I think voters just assumed that this money would just be piped right in — just what the industry told them during the campaign. But obviously that's not the case," says Gina Carbone, a founding member of Smart Colorado, a group that opposes widespread retail pot shops. She says voters unfortunately must approve any tax the Legislature settles on. "And I don't think that a lot of voters knew that they'd have to go back" to the polls, she says. It makes Carbone nervous that those taxes could fail at the ballot box in November. She points to a recent audit of the Medical Marijuana Enforcement Division that found the agency is severely underfunded — raising the question of just how regulated Colorado's current medical marijuana industry really is. State Rep. Dan Pabon says there could be dire consequences if the taxes don't pass and there isn't money to beef up enforcement. "I fear the federal government would become involved," Pabon says. "I fear black market concerns — diversion will happen." And that, he says, could force the Obama administration to put the brakes on retail pot.